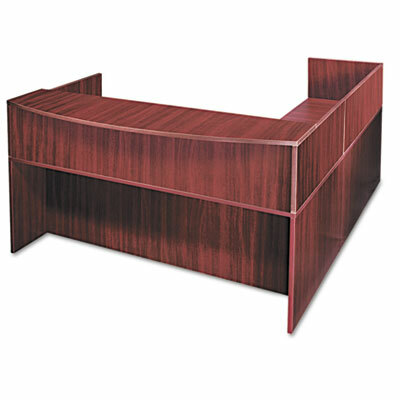 Not freestanding; use with bow-front reception counter, sold separately, to fully enclose a 72 x 90 "L" reception station. Durable woodgrain laminate finish provides strength to stand-up to daily wear-and-tear. Not freestanding; use with bow front reception counter, sold separately, to fully enclose a 72 x 90 "L" grouping reception station. Reversible—can be mounted on left or right side to accommodate workspace needs. Keeps documents and files protected by adding privacy to the reception area. Disclaimer Statement(s) Use with bow-front reception counter, sold separately, to fully enclose a 72 x 90 "L" reception station.